I am walking down the street on a Saturday morning, past the train station and on to the hotel Esplanade. Along the way, I stop in a Zen-like landscaped park in front of the regional hotel institution. Zagreb is bustling in its Saturday spirit and I am driven by desire for the best coffee in town in the bar Esplanade 1925. Zagreb is worth a visit just for this, and also because the best Croatian barman, Srečko Šoha, and his team knows how to take care of guests. Served in the old café manner with a freshly squeezed orange juice, it’s sure to banish the pulsing in the head after a wild night out. The hotel was built in 1925 with the aim of offering luxury accommodation to passengers of the legendary Orient Express, which travelled from Paris to Istanbul and back. From its very first beginning the hotel has had an important social function, as dance evenings for the elite, receptions and events reflective of the Croatian capital all took place there. Built in the then popular Art deco style, the hotel was renovated in 2004, maintaining its brilliant and elegant style. An important event in the history of Zagreb was the arrival of the railway in 1862. A few years later, in 1892, the main railway station was built. 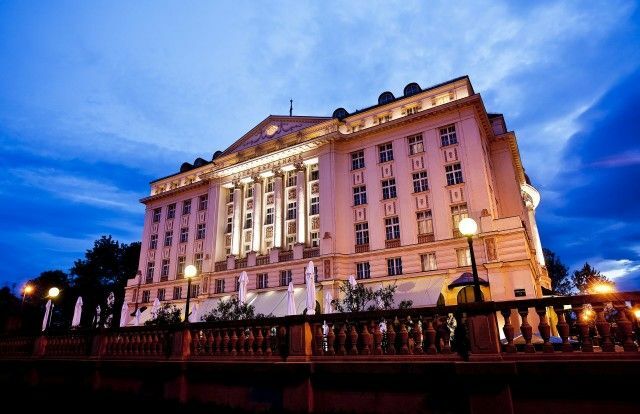 Hotel Esplanade was also built because of the guests on the famous Orient Express from Paris to Zagreb, such as Agatha Christie in 1928, which sometimes stopped in Zagreb. The train, which oozed luxury and titillated the imagination of writers, last rolled along its tracks in 1977. The long list of celebrities who have visited Esplanade includes many persons who had a great impact on the 20th century: Josephine Baker, Charles Lindbergh, Orson Wells, Liv Ullman, Louis Armstrong, Woody Allen, Richard Burton, Elisabeth Taylor, Sofia Loren, Mick Jagger and the Rolling Stones, the politicians Nikita Hruščov and Leonid Brežnjev are just some of the many guests who have signed into the hotel guestbook. In 1964 the hotel was one of the first hotels of socialist countries in the Inter-Continental chain. In 1988 it took its place in the association of “The Leading Hotels of the World”. It is now a member of The Regent hotel chain, as the only regional hotel of this prestigious hotel chain. In the hotel the first Croatian Casino and the first Bistro was opened. This year it received the award for the best luxury city hotel and best historic luxury hotel at the World Luxury Hotel Awards ceremony. The legendary Emerald Ballroom, which can host up to 280 participants and is supported by seven smaller halls, is unique and possibly the most exclusive congress hall of the region. It is simply the most spectacular events space in Zagreb. With its soaring, dome-shaped roof and ornate feature windows, its unique style will remain in the minds of guests long after an event has finished. The Esplanade Zagreb Hotel has for many years, in fact even since it was built, been synonymous with fine cuisine and a high quality of food and ingredients used, along with exceptional service. This remains the case today and it is always a step ahead of the rest. Delicacies are prepared that connect Zagreb with the Mediterranean and continental Europe by choosing and combining flavours that are constantly fresh and creative. At just 34 years old Ana Grgic is already head of the kitchen of the prestigious Hotel Esplanade, responsible for ‘Zinfandel’ and ‘Le Bistro’, as well as Esplanade catering. She came to this position from being deputy chef of a hotel where she began her career immediately after completing catering school. Ana continues to follow the Esplanade tradition of haute cuisine, but with her selection and combination of flavours in creating menus she gives her own signature to dishes on a daily basis. This traditional specialty of Croatian Zagorje, derived from the hilly region of picturesque fields and pastures, took an important place in the hotel offer from the first day, especially at events and conferences. ‘Štrukli’ were launched back in 1951, when they were found on the hotel menu for the first time, which to this day has kept the tradition of preparing and serving this irresistible delicacy. Most interestingly, ‘štrukli’ still receive the greatest fame and popularity ahead of all the other delicacies – the majority of event participants immediately gallop toward them and they disappear in a flash. The hotel is an excellent choice for business and congress guests and is probably the regional flagship in terms of service quality, customer care and prestige. Staying at the hotel is a special experience, with a package that gives you a feeling of luxury: the 250m2 presidential suite named after Orson Welles, who once stayed at the hotel, and the sheer number of tiny surprises and pampering at every step. Visas: Visa requirements are determined by nationality. The last Orient Express passed through Zagreb in 1977. The legendary train, which travelled between Paris and Istanbul, is the main reason for the development of Hotel Esplanade near the Zagreb Train Station and the centre of the city, with a view of Zrinjevac Park. With its central location the hotel is easily accessible and it offers all the comfort of a top-notch hotel. Air access to Zagreb is constantly improving and a planned expansion of the airport suggests that more and more air carriers will be choosing to fly to Zagreb.